The blueberry muffin is America's favorite muffin recipe. 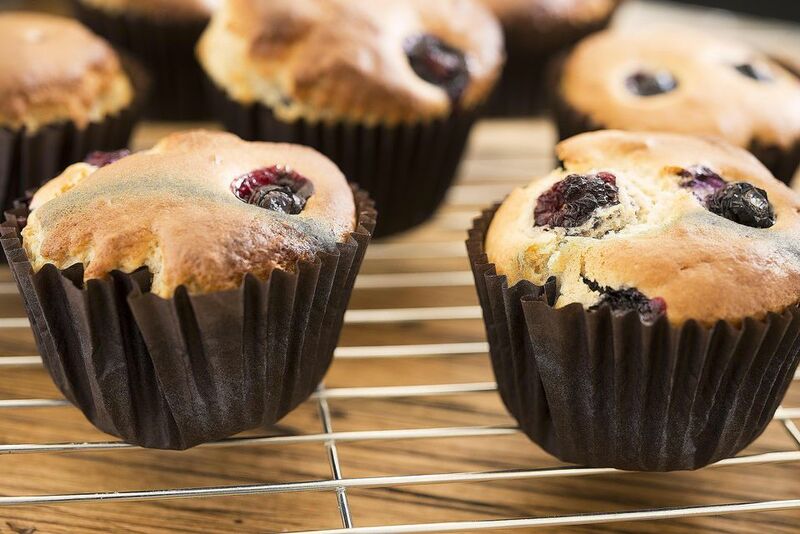 This easy recipe will produce a tender and light blueberry muffin, as long as you don't over mix the batter. Sift the flour, baking soda, and baking powder into a large bowl. Add the sugar and salt; mix, and set aside. Whisk all the wet ingredients together in another bowl. Add wet ingredients to the dry mixture and mix with a spatula until just combined. Add blueberries and fold in gently. Don't over mix. Line the muffin pans with paper liners. Use an ice cream scoop to fill muffin liners up to a 1/2-inch from the top. Sprinkle the tops with sugar. Bake for 20 minutes, or until golden-brown. As soon as they have cooled enough to handle, remove the muffins from pan.